﻿ What is Fiber Optic Transceiver? Fiber Optic Transceiver also known as Fiber Optical Transceiver,Optical Module,Optics Module etc. It is a single,packaged device that uses fiber optical technology to transmit and receive data. ‘Transceiver’ is a combination of two words,’transmitter’ and ‘receiver’. In other words,the fiber optic transceiver comprising both a transmitter and a receiver which are combined and share common circuitry or a single housing. It is an important part of optical network eqLog Outuipment that has electronic components to condition and encode/decode data into light pulses and then send them to the other end as electrical signals. To send data as light,it makes use of a light source,such as VSCEL,FP and DFB laser,which is controlled by the electronic parts,and to receive light pulses,such as Pin,APD,it makes use of a photodiode semiconductor. Fiber Optic Transceiver are classified into various types to meet diversified requirements. Transmission rate is the number of bits transmitted per second. The unit of measure for transmission rate is Mbps (Megabits per second) or Gbps (Gigabits per second). Depending on transmission rates,fiber optic transceivers are classified into 0.5Mbps, 2Mbps, 10Mbps, 52Mbps, 84Mbps, 100Mbps, 155Mbps, 350Mbps, 622Mbps, 1Gbps, 2.125Gbps, 2.5Gbps, 3Gbps,4.25Gbps, 6Gbps, 8Gbps,10Gbps, 16Gbps, 25Gbps, 32Gbps, 40Gbps, 56Gbps, 100Gbps, 120Gbps and 200Gbps. By fiber optic transceiver package, they are classified as QSFP, QSFP28, CFP, CFP2, CFP4, CXP, SFP, CSFP, SFP+, GBIC, XFP, XENPAK, X2, 1X9, SFF, 200/3000pin, XPAK, etc. Optical fibers are classified into single mode fiber SMF and Multi-mode fiber MMF. Therefore, fiber optic transceiver are also classified as single-mode and multi-mode transceivers to support different optical fibers. The multi-mode transceivers usually has a transmission distance of 10km to 160 km,while the multi-mode one’s used for short transmission distance such as 0.5km to 2km. There are many different transceiver for various application. By different application,fiber optic transceiver are also classified into SONET/SDH,FE/GE/10GE/40GE/100GE Ethernet,Broadcast Video,CPRI,LTE,Fiber Channel,etc. Take the most popular SFP/SFP+ as an example, the fiber optic transceiver is comprised of the below parts. The other XFP,QSFP,CFP,CFP2,GBIC optics have a similar structure. Fiber Optic Transceiver are widely found in wired networking applications such as Ethernet, Fibre Channel, SONET/SDH/ONT, CPRI ,FTTx and InfiniBand. The platform including Ethernet switches, routers, firewalls,network interface cards and fiber media converters. Storage interface cards, also called HBAs or Fibre Channel storage switches, also make use of these fiber optic transceivers for different speeds such as 2Gb, 4Gb, 8Gb and 16Gb. • Data Rate: the number of bits transmitted per second. • Transmission distance: the maximum distance over which optical signals can transmit. Optical signals sent from different types of sources can transmit over different distances due to negative effects of optical fibers, such as dispersion and attenuation. When connecting optical interfaces, select optical modules and fibers based on the maximum signal transmission distance. • Central wavelength: central wavelength represents the wave band used for optical signal transmission. At present, there are mainly three central wavelengths for common fiber transceiver modules: 850 nm, 1310 nm, and 1550 nm, respectively representing three wavebands. • Optical Transmit power: Output optical power of an optic transceiver when it is working properly. When two optical transceivers are connected, the transmit optical power of one end must be within the range of receive optical power on the other end. • Receiving sensitivity: the power at which the receiver of a fiber optic transceiver can receive optical signals within a range of bit error rate (BER = 10-12), in dBm. • Fiber mode: Mode of optical fibers defined based on core diameters and features of optical fibers. Optical fibers are classified into single-mode (SMF) and multi-mode fibers (MMF). The multi-mode fibers have large core diameters and and can transport light in multiple mode.However, the inter-mode dispersion is greater so they are used to transmit optical signals over short distances. Single-mode fibers (SMF) have a small core size and can transmit light in only one mode with a small dispersion, so they can transmit optical signals for long-reach communication distances. 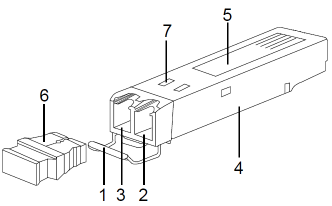 • Connector Type: Type of the interface on an optic transceiver to accommodate a fiber. The Commonly used connector types are LC connector (applicable to QSFP,SFP, SFP+, SFF and XFP transceivers), SC connector (applicable to BIDI SFP, GBIC, X2,XENPAK,1×9 transceivers), ST and FC connector (applicable to1x9 transceivers) ,MPO connector (applicable to QSFP+ SR4, and CXP modules). • Extinction ratio: Minimum ratio of the average optical powerwith signals transmitted against the average optical power without signals transmitted in complete modulation mode. The extinction ratio indicates the capability of an optical module to identify signal 0 and signal 1. This parameter is a quality indicator for fiber optic transceivers. 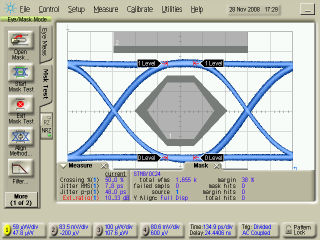 • Eye diagram: an oscilloscope display in which a digital signal from a receiver is repetitively sampled and applied to the vertical input, while the data rate is used to trigger the horizontal sweep.